Handcrafted Beauty’s All-Natural Almond and Honey cleanser takes an oil base and combines it with Organic Castile Soap and Organic Raw Honey to produce a creamy, gentle cleanser that removes makeup and impurities without throwing your skin out of balance. You are going to love how soft, radiant and supple your skin feels after each use. Typical facial cleansers are made with foaming agents that strip skin of its own oils, taking your skin out of its natural balance. It is a myth that more suds means a better clean; in fact, it is these frothy suds that throw our skin into chaos. 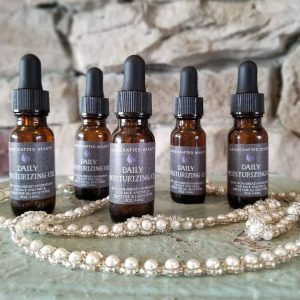 When oil is stripped from our faces, our skin either overproduces oil, causing clogged pores and breakouts, or it dries skin out, causing premature aging. It is time to get rid of these chemical cleansers and move to a natural, effective option. 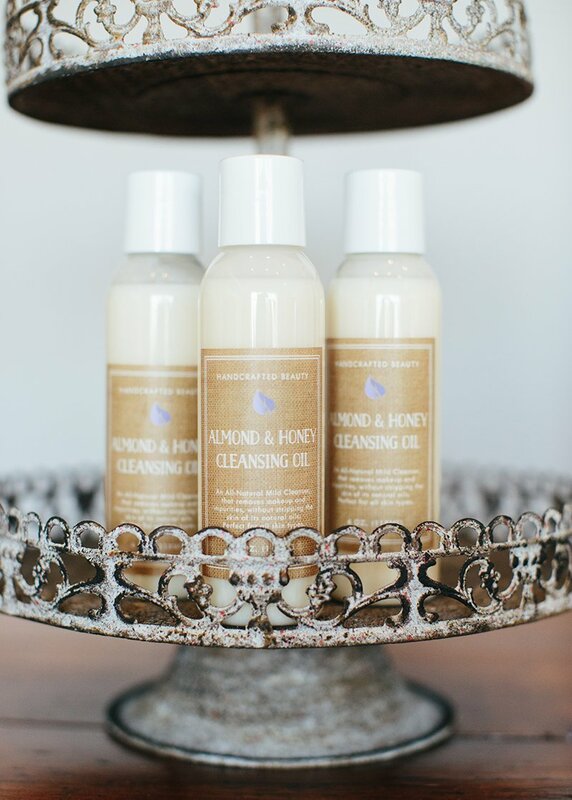 Handcrafted Beauty’s All-Natural Almond and Honey cleanser takes an oil base and combines it with Organic Castile Soap and Organic Raw Honey to produce a creamy, gentle cleanser that removes makeup and impurities without throwing your skin out of balance. You are going to love how soft, radiant and supple your skin feels after each use. Not to mention that it dissolves makeup so quickly, you will not have to rely on additional makeup removers. This formula is gentle enough to be used daily on all skin types. Wet face with warm water, then apply a quarter sized amount into your palm and massage on face in a circular motion. Rinse with warm water and gently pat dry. 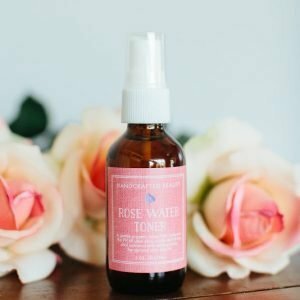 Follow with Handcrafted Beauty’s Rose Water Toner and Daily Moisturizing Oil. Cocos Nucifera(Coconut)Oil, Castile Soap, Prunus Dulcis(Sweet Almond)Oil, Organic Raw Honey, Prunus Armeniaca(Apricot)Oil, Vitis Vinifera(Grapeseed)Oil, Ricinus Communis(Castor)Oil, Simmondsia Chinensis(Jojoba)Oil and All Natural Fragrance Oil. Organic Coconut Oil: Rich in Proteins and fatty acids, coconut oil contributes to cellular health and tissue repair. Long known for its antimicrobial and disinfectant properties yet, gentle enough for all skin types. Coconut oil is also an effective makeup remover. Castor Oil– This oil is well known for its anti-inflammatory, healing and cleansing properties. Castor oil contains a complex chain of fatty acids long known for the ability to reduce the appearance of brown spots and scars. Sweet Almond Oil: Helps Balance out the skin, providing hydration without clogging pores, all while reducing skin irritation, softening and soothing the skin. Jojoba: High in vitamins, minerals and antioxidants, this power oil not only delivers nutrients to the skin but helps whisk away dirt and oil. Since it is the only oil that mimics sebum (your skins natural oil), it is easily absorbed, allowing your skin to balance itself out. Raw Organic Honey: Known for its cleansing properties, honey has antimicrobial and anti-inflammatory properties. Raw Organic honey helps soften the skin, improve the overall tone and texture, and stimulate cells for a healthy glow. I am in love with this facewash! I have extremely oil skin and this has helped balance it out. I also use the oil moisturizer! I can definitely see a huge difference after switching from using a very harsh oil reducing face wash. This is the only face wash that works for my combination skin and I don’t have break outs! I love this face wash! It makes my skin feel so soft and it looks so much better. I love the honey scent it is so calming. Love this gentle yet effective cleanser. Leaves my skin super soft and clean. I am so impressed with how it takes off ALL of my makeup without stripping my skin or making it dry. Best cleanser out there! I’ve never loved a cleanser as much as I love this one. My skin feels like a baby’s bottom and it’s amazing!!! I’ve always had issues with acne and for the first time I feel like I don’t have a zit to cover up everyday. I have oily skin so I was a bit concerned with using an oil based face wash but it has actually helped balance that. Mind blown! I have been using this cleanser for a few years now. I absolutely love it. I was a Proactive user for several years and thought I could never move away from it until I was introduced to this cleanser. OMG, life changing! Not only does my face not break out anymore but it feels so soft and smooth. And it takes your makeup off with little effort! I can’t say enough about it. LOVE IT!